Grain Sorghum, grown mostly for feed grains for the beef, dairy, pig and poultry industries, is grown in most regions of Queensland. It supplies 60% of Australia’s supply. Once the crop is harvested, the non-utilised part (the stalk or straw) is left over and disposed of either by ploughing back into the soil, which can be costly, or by burning, a practice which has been identified as a significant contributor to greenhouse gases. 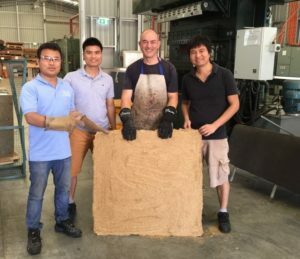 An innovative concept of using this residual fibre to create an agri-fibre composite panel is currently being researched by the Queensland Government’s Department of Agriculture and Fisheries (DAF). Training on developing products from this agri-fibre residue and forest plantations was recently held at the DAF Salisbury Research Centre. Research scientist Mr Tien Manh Ha from the Vietnamese Academy of Forest Sciences, Hanoi, and teacher Mr Phouluang Chounlamounty from the National University of Laos both attended the training. multi-laminar LVL panels for furniture. 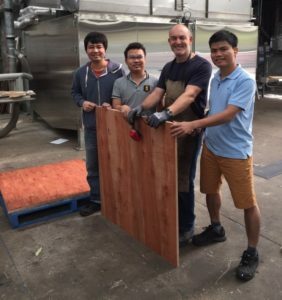 The training is transferrable to the Australian forest and forest products industries, which will be well positioned to increase resource utilisation, minimise waste, increase processing and manufacturing efficiency, and improve market competitiveness. The skills gained by participants underpins their activities in two current ACIAR projects titled: ‘Enhancement of production of acacia and eucalypt peeled and sliced veneer products in Vietnam and Australia Veneer processing’ and ‘Enhancing key elements of the value chain for plantation-grown wood in Lao PDR’.